Charlotte has been across here in Melbourne with me for a few days, as Cocoa Berry completes yet another year end. Aside from all the work we got done, we did manage to squeeze in a little shopping. Okay, a lot. 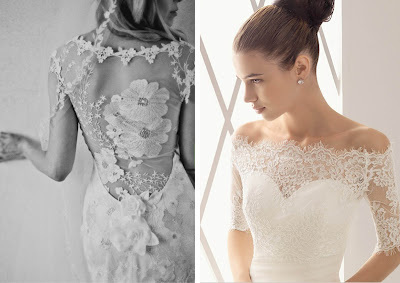 Lace is something we came across again and again and we actually both ended up purchasing beautiful lace dresses for upcoming weddings we're attending (one in NZ and one in the UK). Which lead to me to todays post - I just can't get enough of lace. It is beautiful. It is classic. It is elegant. This is of course when it's done in the right way - I'm sure we've all seen it done in the wrong way too! Lace and weddings go together extremely well. 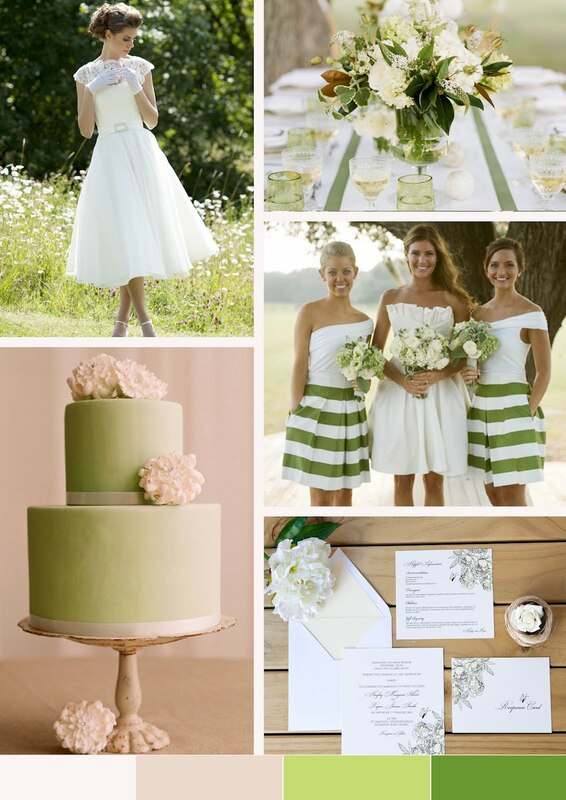 It may be the main feature, ie the dress. 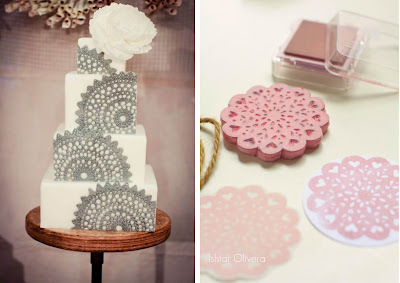 Or it could be used with embellishments such as table clothes, perhaps the design on the cake or decorations. Include it any which way... it just looks stunning. If you're out and about shopping this weekend, have a look around and see what you can find... there's loads here in Melbourne and I'm sure in NZ too... or wherever else you may be! We had the pleasure of working with the lovely couple Jane and Simon recently. 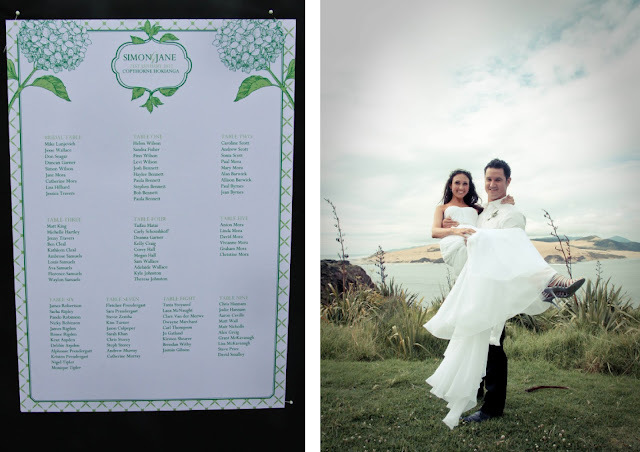 There were married on the 21st of January 2012 up north in Hokianga. 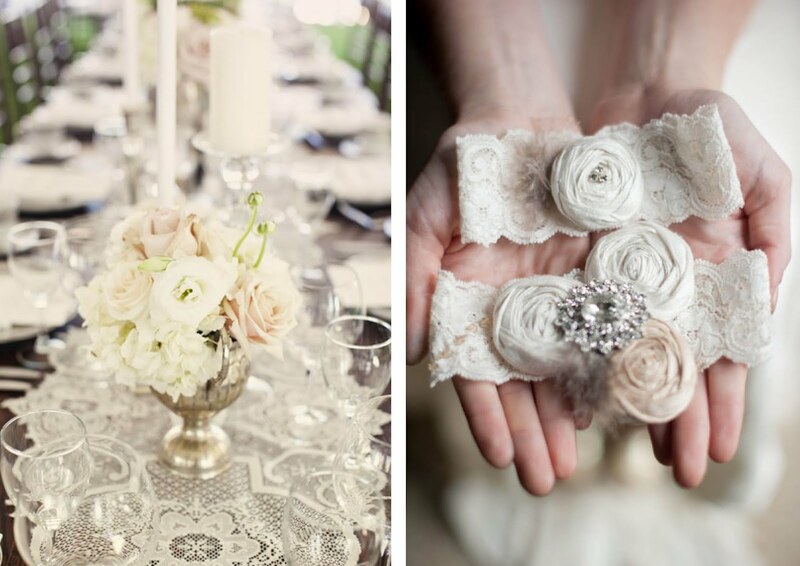 They went for a beautiful soft romantic theme, with gorgeous flowers gathered from the garden, sitting in little apothecary jars on the tables. 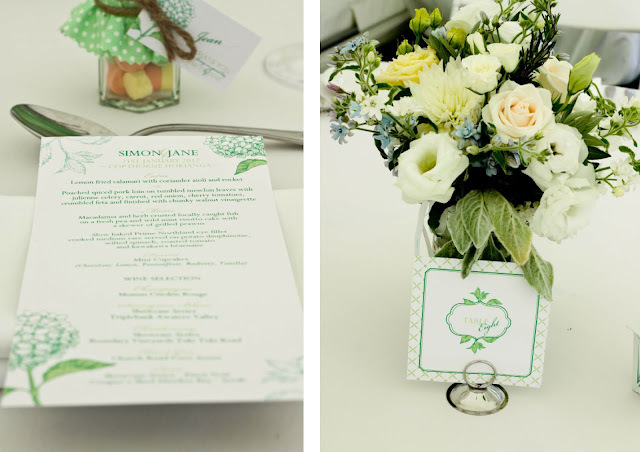 Including the oh so lovely hydrangeas consisting of both greens and blues... so it made sense for them to choose the 'Botanical' design we have at Cocoa Berry for their wedding stationery. On the day they required a table plan, table numbers, menus and little favour tags too which you'll see in the photos below. 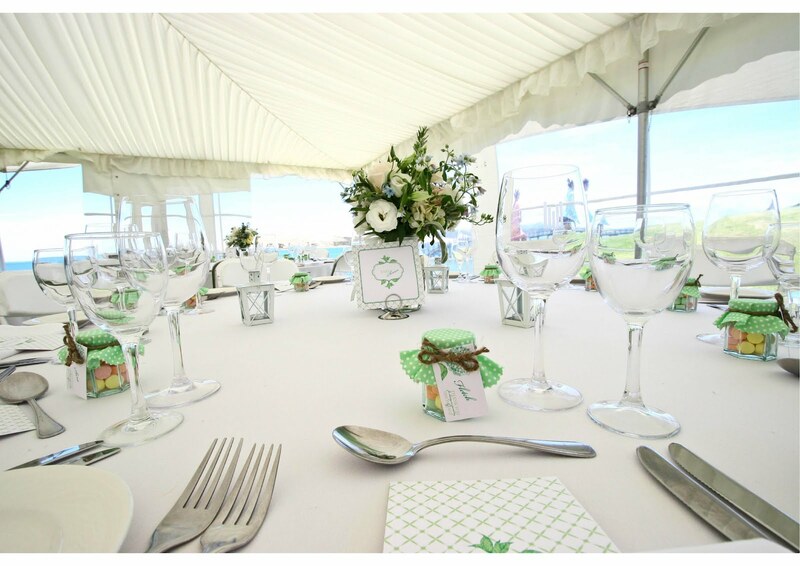 Many thanks to Diana Sanders for these lovely photographs, we appreciate you sending them through to us! 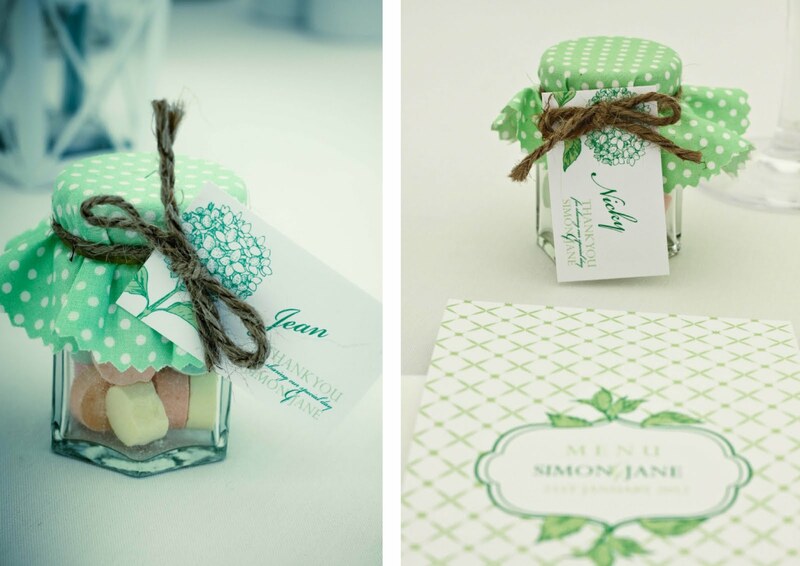 It was wonderful to work with Jane and Simon and we wish them all the very best for their future together! Good morning everyone, hope you're all having a lovely Tuesday so far. 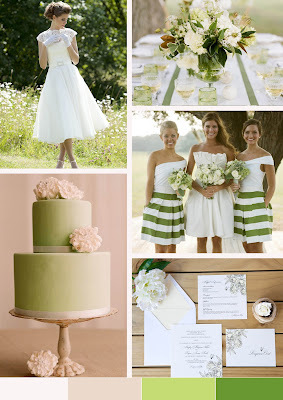 Soft greens or blush? 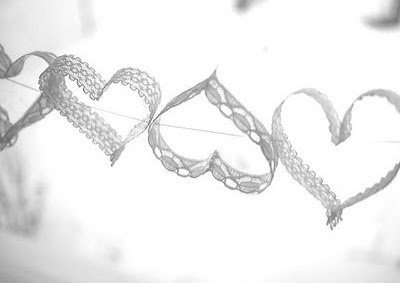 Whether you're a bride to be or not, let us know! The 3 things we heart today are all images direct from The Caketress. Actually, make that 5 images. A new look for us! The berries thought that it was high time to rebrand - we've been up and running for 3 years now and have certainly learnt a great deal about what goes on in the wedding industry... one thing is for sure - it is constantly changing. So with 2012 well and truly upon us, we thought it was the perfect time to launch our new look just before our 3rd birthday (in April). 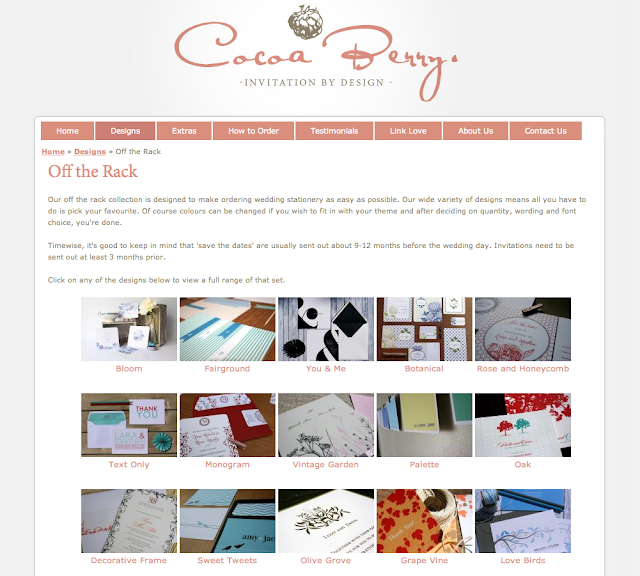 Those of you who are familiar with us, will know that we had a Berry Red and Charcoal colour scheme which we loved for those early years - but now its time to say farewell to that... and HELLO to our new colours, Tawny and Ash Brown. It's a tricky thing because you always think you'll have enough time to upload new images to the website as they happen - but work (and life!) just always seem to take over! So we're pleased to be able to finally share them with you. The website is a continual work in progress. There are actually still more changes to come - we'll keep you updated as we continue to improve and expand Cocoa Berry online! 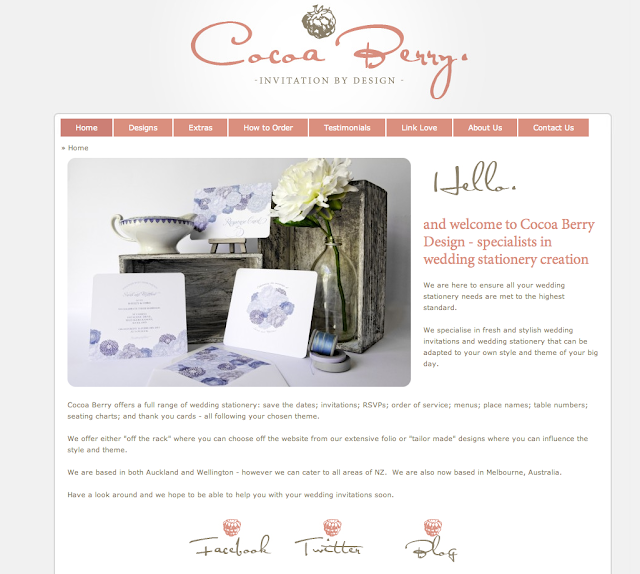 The other exciting part of Cocoa Berry is that our gorgeous cousin Silvie joined us in the last few months... we mentioned this briefly towards the end of last year, but wanted to officially let people know that she is based in Auckland and will be the friendly berry you'll see if you require a meeting to discuss your tailor-made invitations. Silvie has always been our number 1 Cocoa Berry fan - supporting us right from the very beginning, she has certainly seen us grow. Attending all the shows with us in Auckland and Wellington, she's seen all the highs and lows and brings so much positivity to the company that it's infectious! So a very big (official) welcome to Silvie! 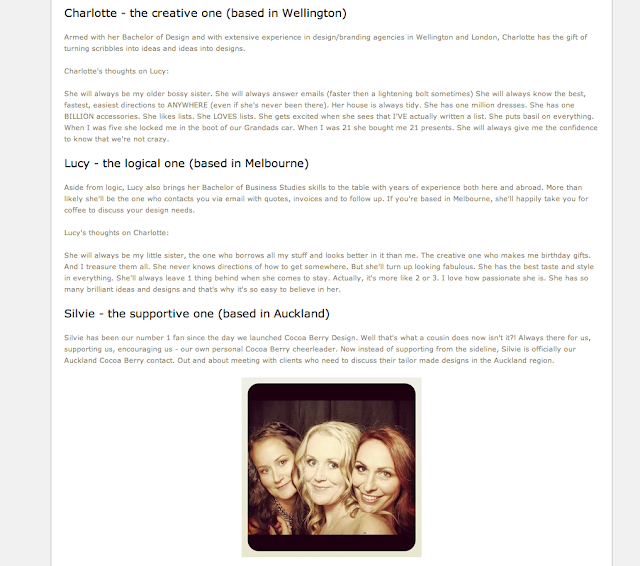 Charlotte is still based in Wellington and is non-stop designing - the time and energy that goes into her work is inspiring - she is so dedicated to ensuring everything is perfect for our clients that it's no wonder she runs out of time at the end of the day. 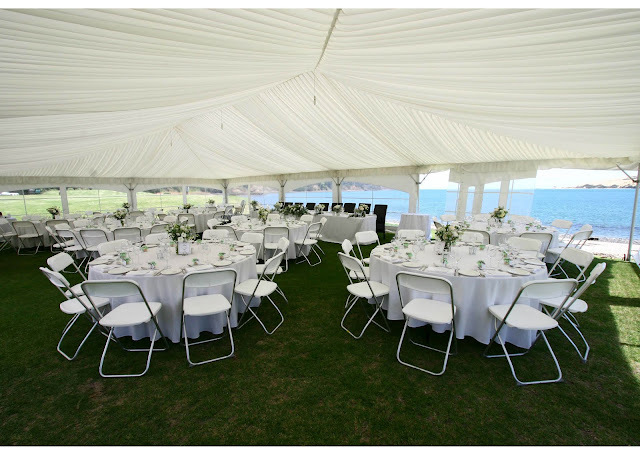 Charlotte also meets with any of our Wellingtonian clients who want to discuss tailor made designs. 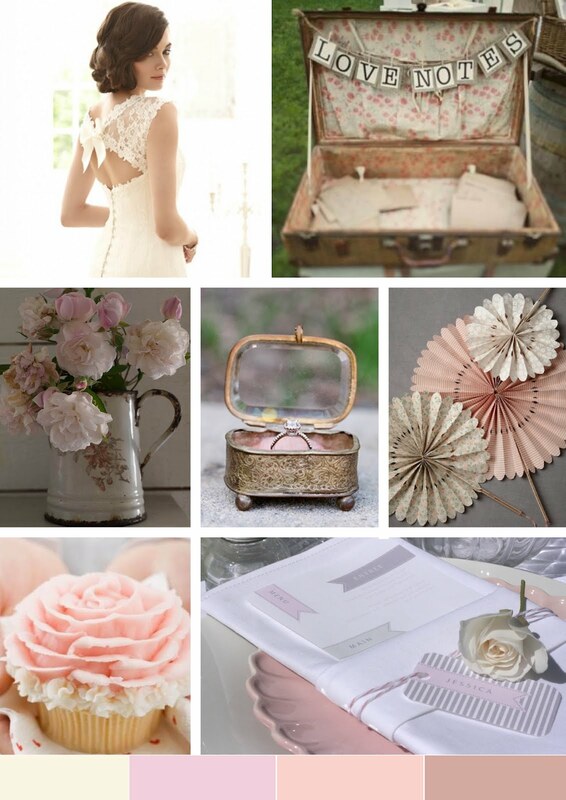 Lucy is now across in Melbourne and is diving into the Australian wedding industry. She is already meeting with potential new clients for 2012/2013. 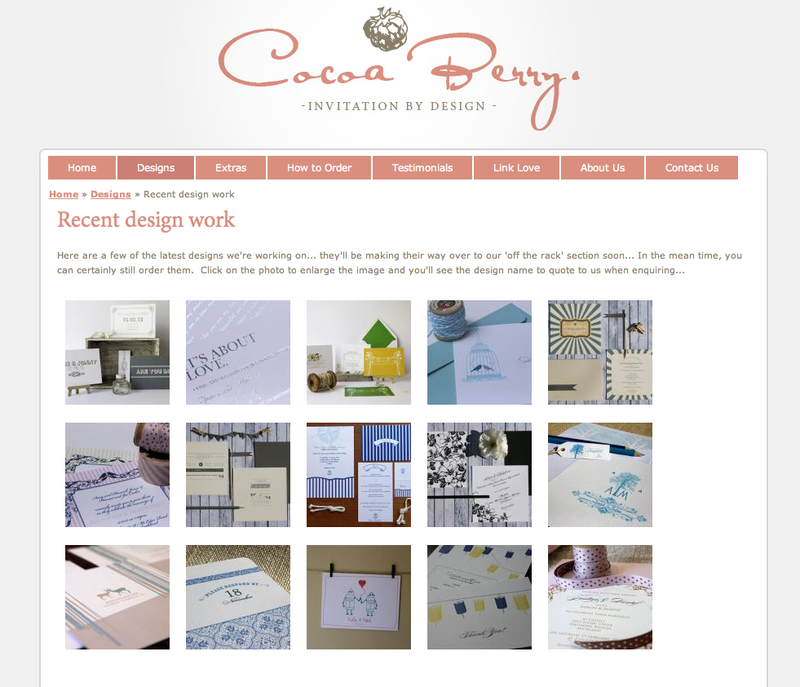 It's an extremely exciting time to explore this new area for Cocoa Berry Design. We've updated the look of our blog as you can see and look forward to sharing our new designs, stories about spotlight couples we're working with, and all the beauty that is involved in the wedding industry.